Dining Services at the University of Rochester has incorporated sustainability into its plans through a variety of programs and initiatives. The University of Rochester offers many local foods on campus. Dining Services now devotes 40% of its purchasing to local foods, up from 20% two years ago. Every semester, Dining Services sets aside a week to celebrate these local foods. During Local Foods Week, speakers, events, themed dinners, and representatives from farmers markets and local vendors help spread awareness of local foods and sustainability. Currently, these efforts have earned the University an 'A' rating from the College Sustainability Report Card for food service. The primary dining center for students at the University, Danforth Dining Center was completely renovated and reopened in August, 2011. Furnishings for the hall include plastic chairs made using 100 percent recycled Coca Cola products, and aluminum chairs incorporate 80 percent recycled products. In 2007, the University of Rochester became the first college or university to join the Pride of New York Program. The Pride of New York Program was developed to promote and support the sale of agricultural products grown and food products processed within New York State. Dining Services began composting through a pilot program with Freshwise Farms in 2007. The University currently composts about 2.2 tons of food waste per week with a total of nearly 27 tons collected from August through December. Compostable materials generated from food production are collected in every kitchen, and Pura Vida, Hillside Cafe and Connections Cafe offer compost bins for student use. These locations also feature compostable plates and utensils. Behind the scenes, 100% of recyclable metals, plastic and glass from dining center kitchens are recycled. In further efforts to decrease waste production, Danforth Dining Hall went "tray-less" for Earth Day, April 22nd 2008. Since then, trays have been eliminated in Danforth, resulting in less water and energy used for cleaning, as well as a decrease in food waste. Styrofoam is no longer used in any of Dining Services Operations. Styrofoam containers, soup bowls and plates have been replaced with paper, compostable, or recyclable materials in order to decrease the long-term impacts of our waste. A pilot program for reusable to-go containers has begun at Eastman School of Music. With this program, students and staff can purchase an EcoClamshell reusable container as a to-go option to reduce the use of disposable plates and containers. When they return to the Dining Center, they may drop off their used container to be cleaned while they pick up a new one. In Fall 2010, the clamshell program was brought to the River Campus. The program costs students $5 to start and lasts for the student's entire college career. Clamshells are washed by dining so all students have to do is pick them up and drop them off. Ceramic mugs program: Starbucks and Hillside has a ceramic mug program in Starbucks and Hillside. The reusable mug prices applies to the ceramic mugs as well. In addition, the University of Rochester considers Dining Services Employees an integral part of promoting sustainability on campus. Therefore, regular job training includes workshops on energy conservation, waste minimization, and recycling. Dining Services now employs a Team Green of five students to assist in sustainability efforts, as well as to serve as a link between the student population and Dining Services. Team Green includes two Sustainability Marketing Interns, two Student Sustainability Coordinators and one Student Sustainability Manager. Since 2005, the University of Rochester has been increasing the amount of socially responsible coffee available on campus. Pura Vida boasts 100% Fair-Trade, organic, shade-grown products, found at Pura Vida Cafe and in the Pit. Starbucks Cafe at the University of Rochester features at least one Fair-Trade coffee option at all times. Coffee Connection coffee is found at Danforth Dining Halland Connections Café. This is locally roasted, fairly traded coffee that supports struggling adults in Rochester. Finger Lakes Coffee is offered in Hillside Cafe and Simon Cart, featuring exclusively fair trade and organic coffee. Joe Bean offers fair-trade, organic products at Wilson Commons. Fair Trade chocolate is also available at Pura Vida and the Common Market. Flexitarian Mondays, a national program aimed at reducing the amount of meat consumed, has been started at Danforth Dining Hall. While meat is still available in this location, more vegetarian options are featured one Monday every month. Monterey Bay seafood nights at Eastman Music School take place every month. These meals feature seafood from Monterey Bay, a seafood watch group for sustainable choices. In Fall 2005 Dining began sourcing cage-free eggs exclusively. Since that time it has been unclear if either animal rights or the environmental concerns are greatly improved though the cage-free program, and therefore Dining has cut back on their purchase of cage-free eggs. We buy environmentally responsible fish, using the Monterey Bay Seafood standards. The Commons went through a complete renovation over Summer 2010. The renovation did take into account environmental issues such as lighting, energy and materiel use. The new Commons has LED Lights that are dimable. All appliances were purchased energy efficient when available and back loading refrigerators were added to reduce the energy loss from loading. Reclaimed glass counters and sun-baked tiles are just some of the examples of the environmentally conscious materials used. 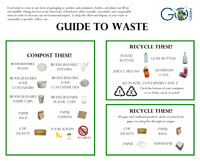 Not Sure What To Do With Your Waste? Find out more recycling options at the Sustainability recycling page.